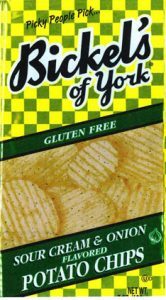 Potato Chip Recall Announcement – Bickel’s Snack Foods, Inc., has issued a recall for its sour cream and onion potato chips, because the products have the potential to be contaminated with the foodborne pathogen, Salmonella. All snack products that were made with ingredients from the seasoning supplier, Valley Milk Products, are subject to this recall. Bickel’s was notified by Valley Milk Products of the risk of Salmonella contamination on December 16, 2016. Sour cream chip brands covered by the recall include Key Foods, Cabana, Troyer, Bon Ton, Bickel’s, and Seyfert. For a list of product UPC numbers, sizes, and best by dates, please see Bickel’s Recall List. Symptoms of Salmonella food poisoning (salmonellosis) may include diarrhea (sometimes bloody), abdominal cramps, nausea, vomiting, fever, chills, headache, muscle pain, and joint pain. Symptoms usually appear within 6 to 72 hours after eating a Salmonella contaminated food. The elderly, infants, and those with impaired immune systems are more likely to suffer severe illness. Most people recover from Salmonella food poisoning within 4-7 days; however, severe diarrhea and/or vomiting may lead to dehydration and electrolyte imbalance requiring rehydration with intravenous fluids. In the most severe cases, the bacteria may spread from the intestines to the blood stream (septicemia) and other body sites. This can result in death, unless the person receives immediate antibiotic therapy. Please see Food Poisoning Lawyers NJ to learn more about The Weinberg Law Firm. If you or a loved one is diagnosed with Salmonella, are awaiting medical confirmation of infection, or have a question regarding your legal rights, you can request a free legal case evaluation by calling our firm toll 1-877-934-6274. You can also contact us online by submitting the easy to use Case Evaluation Form found on this page.